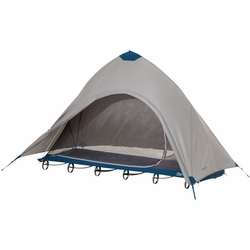 Therm-a-Rest Cot Tent. Add weather protection and privacy to your already comfy cot experience with Therm-a-Rest's new Cot Tent. Providing bug-free luxury, full coverage and a waterproof rainfly, the lightweight Cot Tent packs small and hubbed poles make setup a snap. For bug-free protection without the rainfly, check out the Cot Bug Shelter. Cot and bug shelter sold separately.